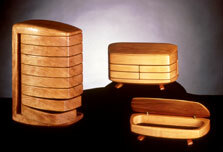 The Kellams line jewelry boxes and accessories were represented by fine craft galleries from Maine to Hawaii for over twenty years. Below are some of the many fine galleries that have represented our boxes. Please contact the gallery of your choice to discover if they still have any Kellam creations. and in beauty we are finished.